Grace knows both jiu-jitsu and teppu-jitsu. The rifle is a Crickett with 4x scope. This entry was posted in interesting people, rifle, training, weapon and tagged 22LR, Crickett. Bookmark the permalink. Congratulations to Grace and her parents. Grace is an example of how to raise a self-sufficient, self-confident young woman and lady. Thanks much Kerodin. We are very proud of her. There is a lot to be said for knowing when and how to protect yourself. Grace is being blessed with two very important courses of study that she will never encounter in an American public school!! Congrats to Grace, and a “very well done” to her parents!! Grace, what age did you start with the Crickett? I have a 9-yr granddaughter that I’m wanting to start. Warning, parents and grandparents can end up volunteered to help out. Thank you much Rocky. 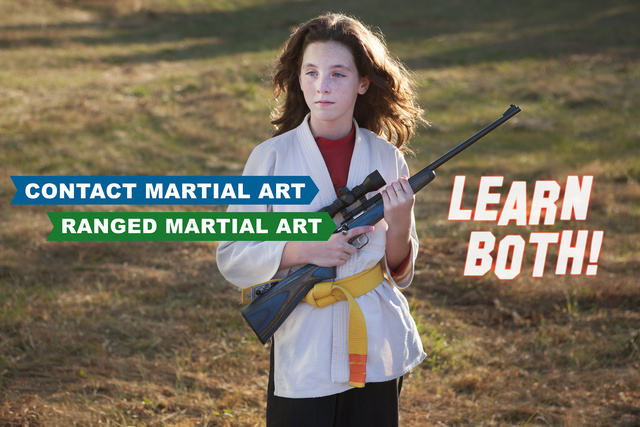 We firmly believe in knowing how to defend yourself from a very early age. Grace has been shooting since she was 10. This is when she started showing a real interest.